Shipping charges apply for this item. Add gift wrap to this item for $3.75. 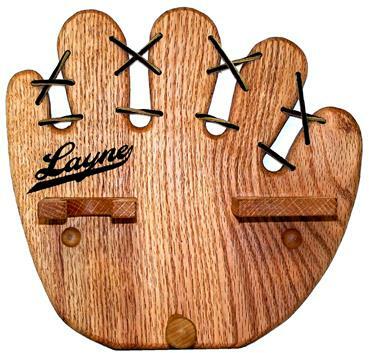 Our Personalized Baseball, Bat, Glove rack is the perfect gift for sports enthusiasts. 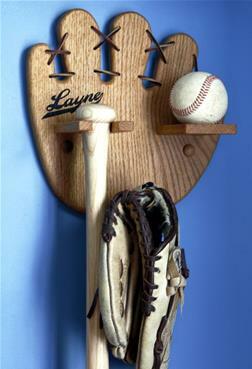 Girls and boys alike, young and old alike; our baseball rack has been known to adorn the walls of kid’s rooms AND man caves. Each rack is personalized with the name of the recipient. Printing is done in color with a UV printer. Person ordering may select from the following colors: Black, blue, orange, yellow, green and pink. 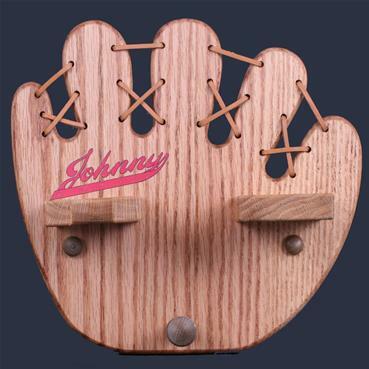 You also have the option to order the Baseball rack with brown or pink leather laces. Each rack is made of solid oak and is finished with a light colored stain. As is the case with all Craft-E- Family products, they are made in our cozy shop in Mooresville, Indiana. If you’re interested in more sports related Craft-E- Family pieces, might we suggest our Personalized Baseball/Softball Team Picture Frame? Made of solid oak with a light color stain.